We had the great pleasure of hearing Robin Heath deliver the keynote presentation at the Summer Crop Circle Lectures last year. It was one of the best lectures I’d heard him give in the long years I have known him; it was important, prescient and above all quite brilliant. He has very kindly given me permission to share that presentation with you and I will be posting Robin’s lecture notes and illustrations in a three part guest blog. I’d like to thank Robin for the opportunity to share his work on the Temporary Temples website – it’s a great honour! Robin Heath is an unaffiliated researcher into megalithic and ancient sciences. He is author of several books on Stonehenge, two of which are on sale at the monument. For more information, there are two websites:www.skyandlandscape.com and www.megalithicscience.org Robin lives on a smallholding in coastal West Wales with his wife Trish, two cats and three theodolites. Who or what do we trust? Are there any absolute facts or anchor points? I believe that there are some answers, and now happens to be an astonishingly prescient time to be looking for answers to these questions, so… let’s start with a little help from a cartoon dog… Back to the threshold, this time of the solar system. PLUTO has recently been passed by a good camera mounted on a good spacecraft. The God of the underworld (or Walt Disney’s cartoon dog named after the Planet around 1930), has attendant moons. 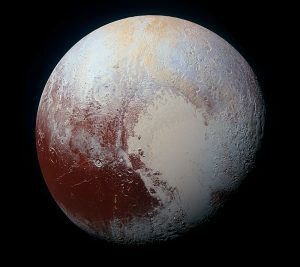 PLUTO, the god of the underworld, has moons – STYX, named after the river over which the ferryman ferries the dead. The ferryman’s name is CHARON. KERBERUS is the three-headed hell-hound, one of the goddess Cybele’s flanking guard dogs. NIX is nothing, obviously, and HYDRA is the multiheaded serpent, who is hard to decapitate. Everything to do with this threshold planet of the solar system is appropriately all very threshold, the mythic theme has somehow been upheld by space scientists. But… there is ORDER here! Relationships and resonances of Pluto’s moons. 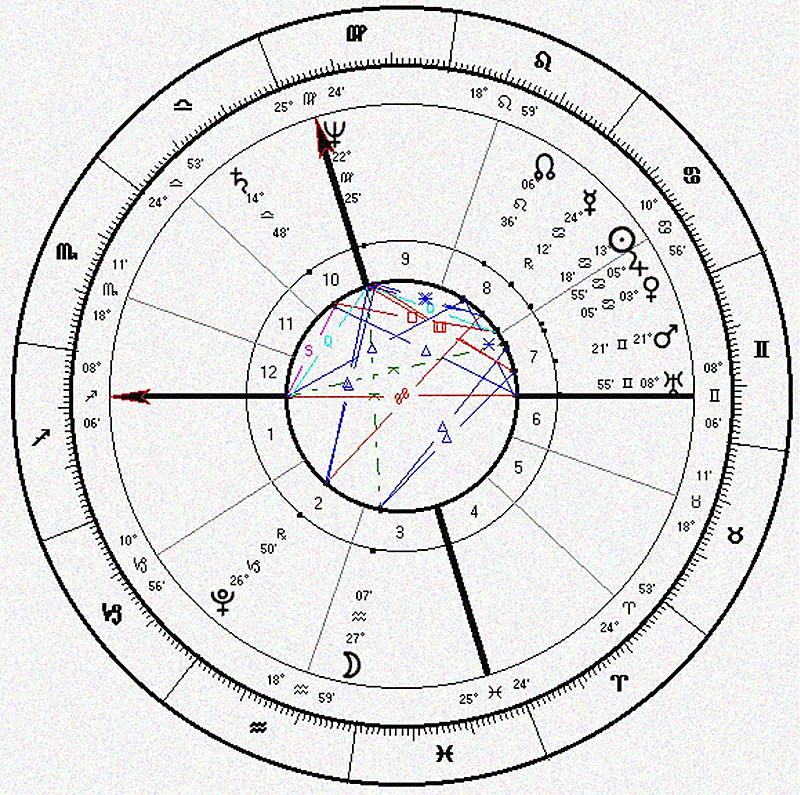 Astrology charts divide the 360 degrees of the sky to show the position of planets and stars. Dividing up the circle of the sky, the circle of the year, into months and days led to the birth of astrology and astronomy. Let’s see some of the evidence for order appearing to those first astronomer/astrologers in the ancient world. 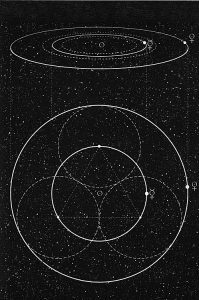 The division of space within the circle of the ecliptic by small whole numbers into discrete Signs & Constellations made it also necessary to reckon with and divide time up into cyclic patterns. 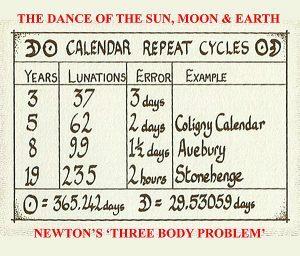 These two acts together – working with the division of both space & time – resulted in accurate calendars, and provided an accurate framework for astronomical observation. It also led to the development of astronomical/astrological prediction using astrology. 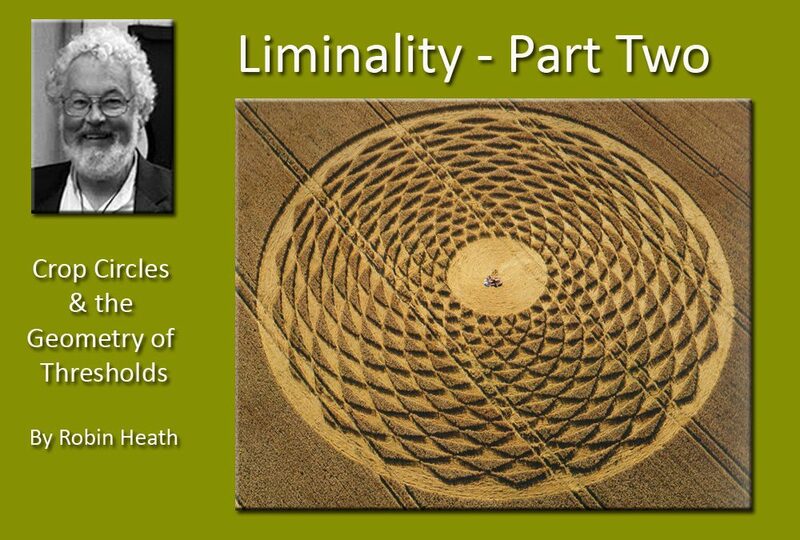 To understand cyclical patterns, there is a need to understand the geometry of circles. There is less chaos and more order in the perceived universe. 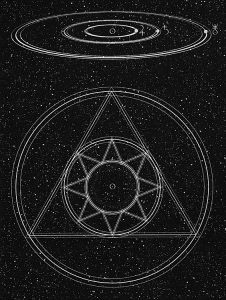 The Search for Patterns in both Time & Space, led to the discovery of ordered Astronomical, Metrological and Geometrical structures. 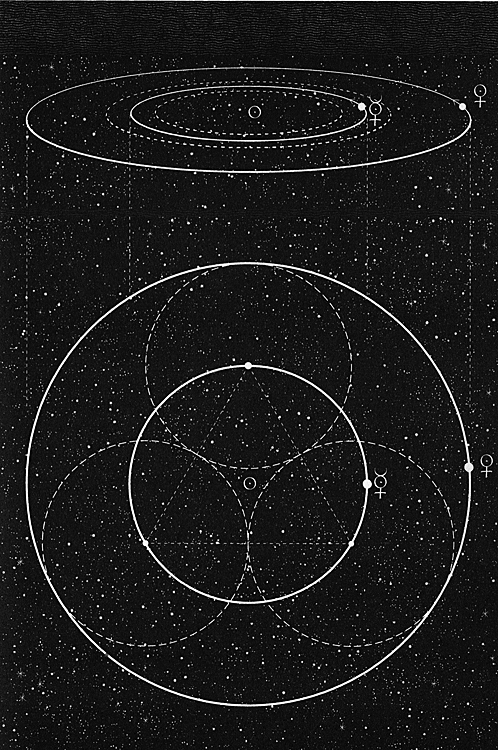 Astronomy in terms of both space and time revealed itself in the form of geometrical patterns. This was how the demiurge became seen to have created the cosmos –an ordered cosmos. Venus makes five retrograding stops in the sky, in eight years. During that period the moon makes almost exactly 99 lunations or lunar months. One outcome of this is that wherever the Sun, Venus and the Moon appears in the sky as you read to this now, will be repeated very closely in exactly eight years time from now. 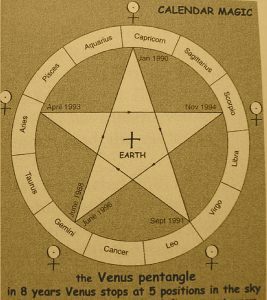 In the so-called ‘Chaldean order’, the angular speed of the planets of the solar system are placed in order around a heptagram. 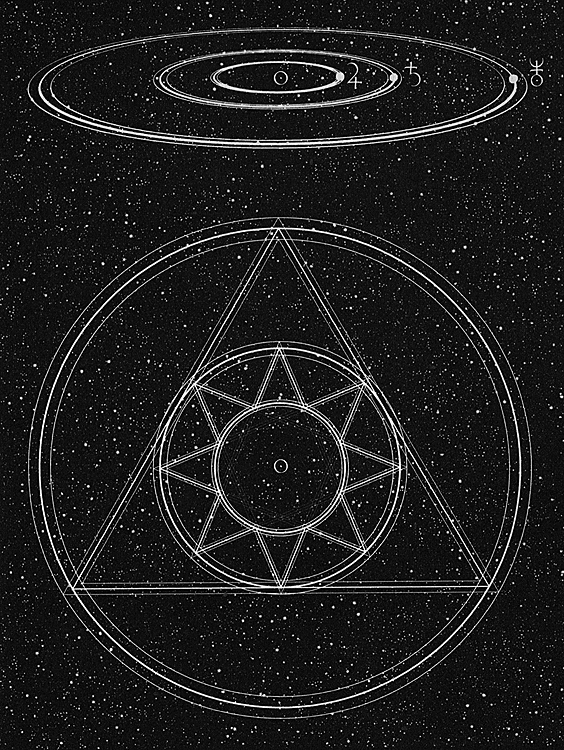 [The sun and moon appear as planets (wanderers) within a system centred on the earth – a geocentric system]. 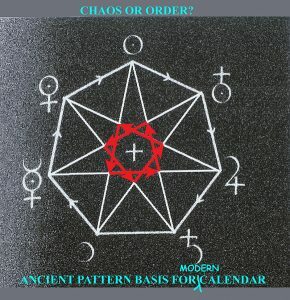 A Heptagram star then traces out the order of the days of the week, which today in most languages remain named after the same planets or their mythic or symbolic equivalents as they did in antediluvian times. 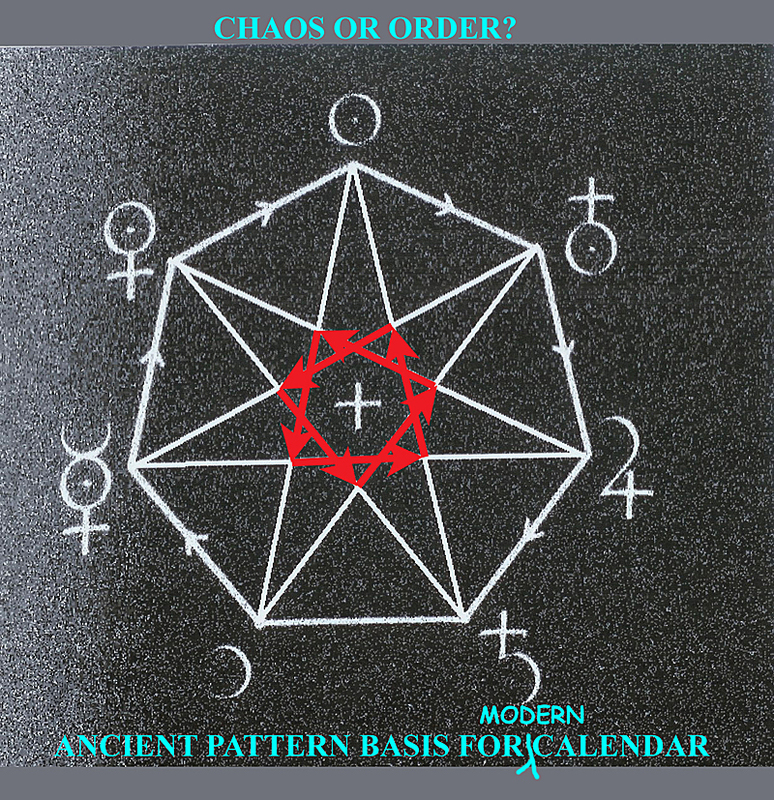 This geometry is a very cool coding system for describing the calendar, the order of the days of the week and the relative speeds of the seven ‘planets’ visible to a naked eye from the earth. 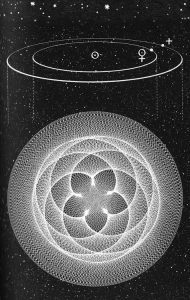 Discovering that the orbital speeds of the seven visible planets, observed from the earth, could be placed in order within the geometry of a heptagram star was one mighty suggestion that the cosmos was conceived of or created as an ordered structure. The order of our present (seven) days of the week stems directly from this geometry. From SUNday follow the red arrows through the week ahead! The ‘Kiss of Venus’, (left) as made famous by that remarkably wonderful graphic from John Martineau. 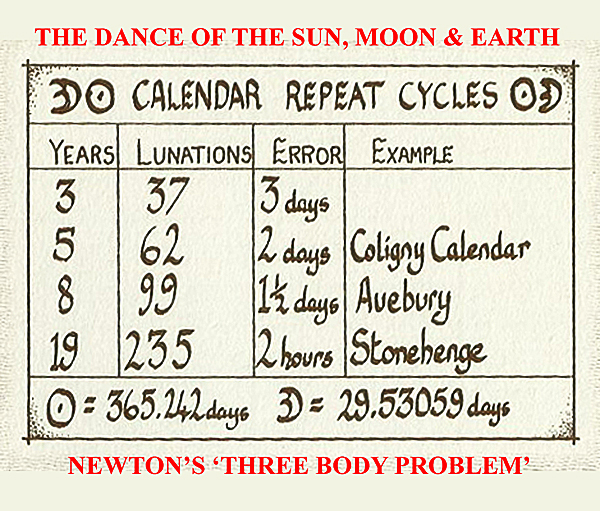 Here the eight year period is shown as the positions of the sun, venus and the earth marked in every few days. The five petalled centre then provides the reason why the Rose is associated with venus, and love, and procreation. Venus is a hot and steamy planet, after all! Another John Martineau illustration (right) showing how the orbits of Mercury and Venus are geometrically ordered around a geometrical truth;- three touching circles arranged around an identical circle define the orbits of the two innermost planets, to a staggeringly high accuracy. Jupiter and Saturn. Together these antithetical planets in myth still manage to kiss each other, every 20 years, this period known in ancient times as the Trigon period. (This geometry is also based on an equilateral triangle, as every ‘kiss’ takes place 120 degrees further around the ecliptic). The orbit of Saturn in years is numerically almost the same as the present length of the lunar month in days (99.77%), a coincidence no doubt. Uranus (revolution) and Neptune (dissolver) are named after the sky god and a sea god. 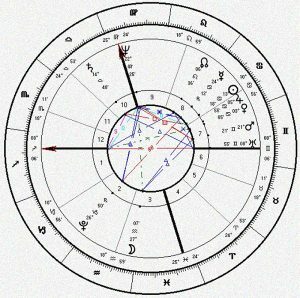 They have become linked to revolution and change (Uranus), and Loosening of boundaries, confusion and confused or chaotic events (Neptune) and historical events subsequent to their link very closely with these meanings, a synchronicity of events with their discovery. John Martineau’s equilateral triangle diagram for the orbits of Jupiter, Saturn and Uranus (right), shows how these gas giants trundle along together in some kind of tight formation, while the effect of Neptune the other planets in this arrangement led to that planet’s discovery in 1846 by, confusingly, Astronomer John Couch Adams or French mathematician Urbain Le Verrier. It is the beginning of the spiritualist movement in the USA and one year later, the discovery by Dr Simpson in Edinburgh of anaesthetics, both liminal events about the loosening of boundaries. Soli-Lunar repeats show an unexpectedly high frequency just a few years. There are three good ones, after 3, 5 and 8 years, and one spectacularly good one (Metonic period) after 19 years , 235 lunations. This 19 year cycle can be found represented in the megalithic and prehistoric artifacts of NW Europe. So, if there is no shortage of geometric order in the solar system, either in space or time, then what of the Earth itself? 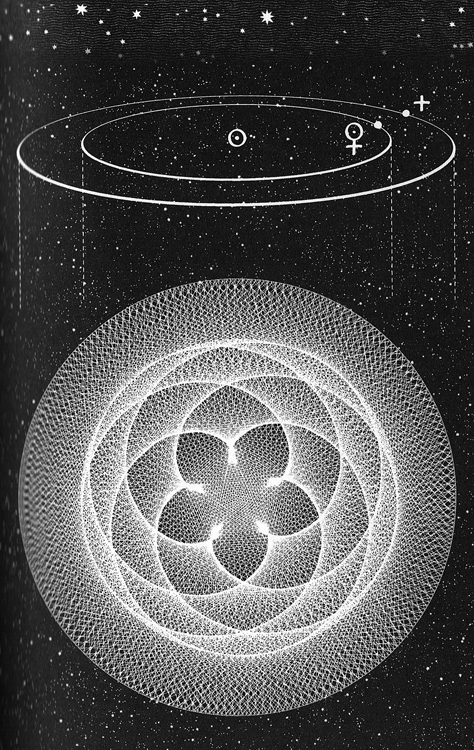 That blue and white gem floating in space also measures up in an orderly fashion, and again the ancients were well aware of the following patterns and numbers, for the ancient systems employed units of length that were embedded as fundamental components of the Earth’s dimensions, contained within the traditional canon of measure (see below). The date for this system being rolled out was long before 4000 BC, based on recent surveys at sites in Brittany and the English Lake District. Real English magic there! The real modern English magician in this subject was the late John Michell, whose genius has yet to be fully appreciated. 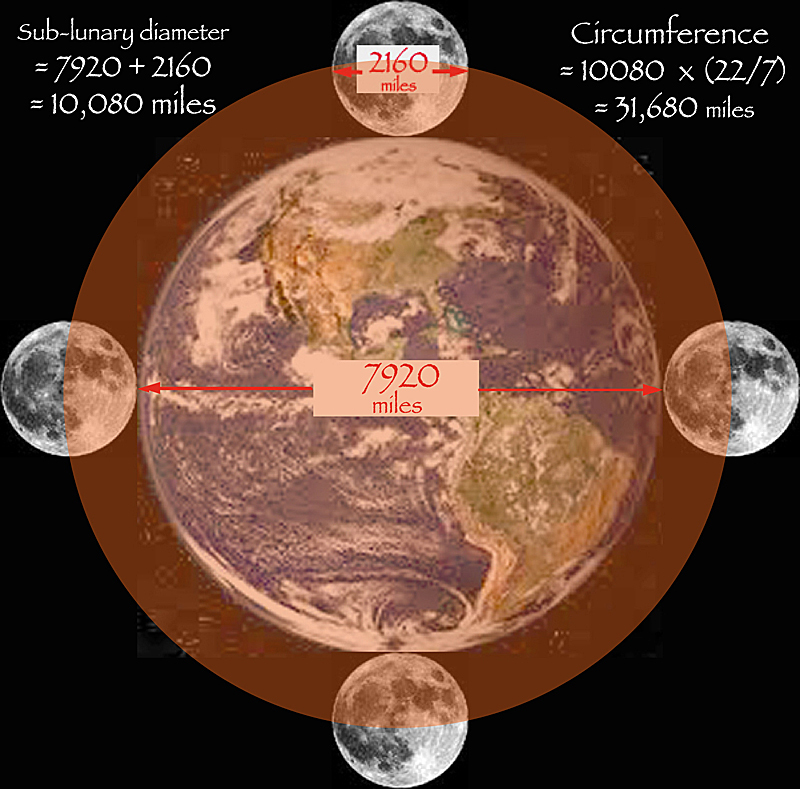 The ‘sub-lunary’ world described by Plato can only reveal its traditional meanings when miles are the unit of measure. 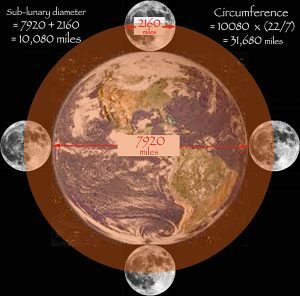 It is easy to see that if any other unit of length, such as the metre, is applied to these astonishingly accurate dimensions for the earth and moon, the result would appear to have no significance whatsoever and no order would be apparent. John’s little sketch in the margin of the Evening Standard was the result of a ‘Eureka moment’ on the top deck of a number 102 London bus. It became a solution providing a guest appearance from the Great Pyramid and a glimpse of the holy-grail of geometry – squaring the circle. The triangle shown is basically thecross sectional profile of the Great Pyramid. 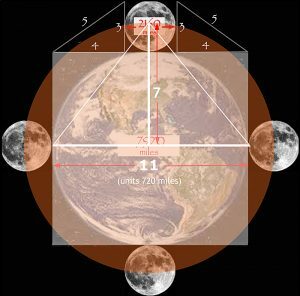 Two 3:4:5 triangles act as ‘bookends’ for the moon, whose diameter is three parts to the Earth’s eleven. All about Eleven and Seven Clever stuff in a Cornfield! In the earth measures the number eleven is embedded as a factor in the numbers, as also is the number seven. This appears to have been a sensible way to make the fraction 22/7 available (as a very close approximation to the irrational pi) in calculations where circumferences and diameters need to be practical (rational) numbers. This playful crop circle is all about these two numbers, and the ‘earth dimension’ diameter expressed here as the circumference, 7920 divided by 10. Look at the factors of the other numbers in this graphic. Recognise that only if feet are the applied unit does this all work. Here the heptagram star divides the circumference up into 7. Graphically this measures up as 22 solid or standing crop ‘triangles’ around the perimeter, which when divided by seven, makes each section of the rim average 22/7 or pi ‘triangles’ long. And the little inner circle is 56 feet in diameter, two cubed times seven. The stuff of Genius, but a genius working in feet. This formation was mowed within a few hours of being photographed – another debt we all owe to our intrepid aerial cameraman Steve Alexander who scrambled his whirlybird in time to snap the circle. Allan Brown found so much ancient metrology applied to this circle that he eventually sent his work off to John, who ‘had never been more amazed and awed’. 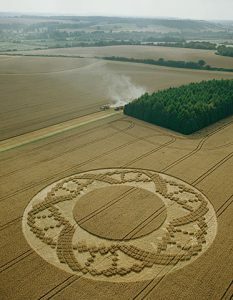 In 2005, they together, wrote a book called ‘Crooked Soley’ about this single ephemeral crop circle. Try and acquire a copy, if you can! Here are the earth measures hidden in the structure of this DNA toroid. 504 standing ‘squares’, 792 flattened ‘squares, total 1296 squares, which is 2 x 2 x 2 x 2 x 3 x 3 x 3 x 3, which times 1000 are the number of seconds of degree in a full circle. This inner structure is built as in the diagram sequence the following images. They warrant study beyond just looking at the images for a few moments. However, the diameters of the inner circles have lengths that have been measured, and these are revealing, and they are only revealing when one employs the foot as the basic measure. Circumference shown in blue is sectioned into two arcs, the arc inside the ‘DNA toroid’ being 5040 inches, that outside being 2880 inches. 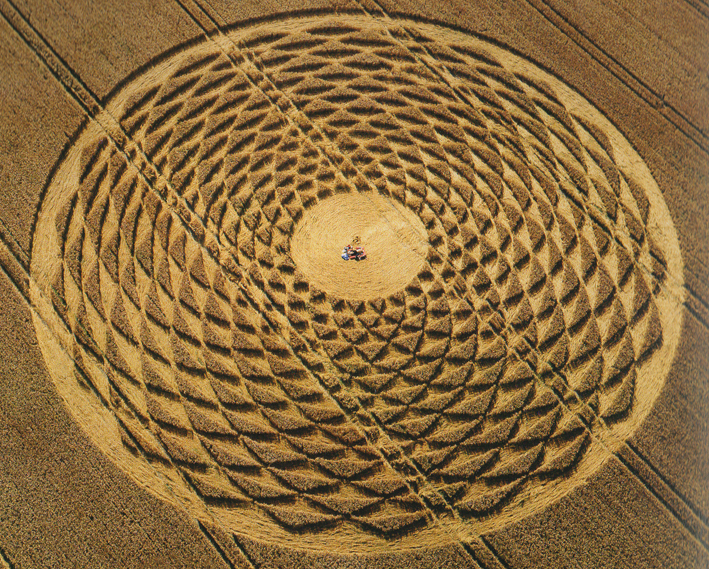 The whole crop circle has a radius of 180 feet. Circumference shown in blue is sectioned into two arcs, the arc inside the ‘DNA toroid’ being 5040 inches, that outside being 2880 inches. The total is 7920 inches. What do these two circles tell us? Well, maybe different things to different people. But of one thing we can be certain. Both the 22/7 ‘Pi’ formation and that at Crooked Soley tell us that the designers understood the ancient system of metrology – that curious mixture of number science and geodetic science, which reveals the two crop circles holding the key dimensions of the planet that we live on. The DNA design found within the Crooked Soley formation might perfectly well be interpreted as a representation of ‘The DNA of planet earth’. Crop circles are of the earth and here they are describing the structure of the earth itself and the structure of its life forms. So, the circle makers know and can apply the ancient system of measures. That’s significant information! Perhaps you thought all along that it was Doug and Dave, who fancied a try at geometry in a field of growing wheat at 3 o’clock in the morning after having read Euclid and John Michell to each other over a few pints in the pub, as they do! With the information from just these two spectacular formations, you no longer need to entertain that idea, nor be bothered with anyone who suggests that Drones, Hippies in old vans, Mystic Meg, John Martineau, Michael Glickman or Robin Heath are responsible. Oh that I could understand how they are made, but I haven’t been able to fathom that yet, nor I am certain have the others on this list. 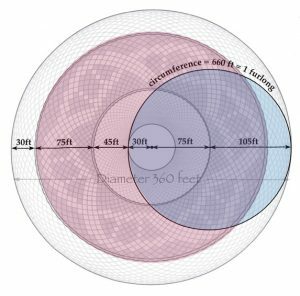 At Crooked Soley, the circle has a radius of 180 feet, the diameter is therefore a canonical 360 feet and the circumference is 360 x 22/7 = 7920/7 feet. Inches can also be found to lock into the earth system of measures. The final circle in the sequence below has a circumference of 660 feet, which is 7920 inches. 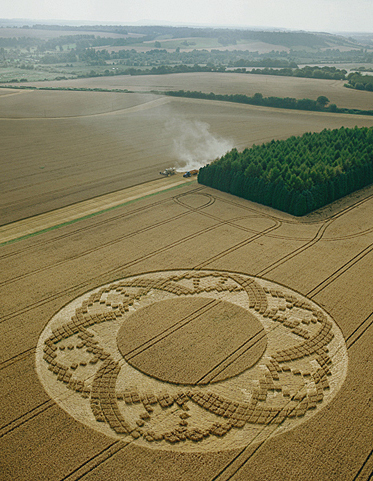 The images below show the metrology and connection between each of the component circles that make up this remarkable crop-circle. Circle 1 – Circumference 2/7ths of 7920 inches. Circle 2 – Circumference 5/7ths of 7920 inches. Circle 3 – Circumference 10/7ths of 7920 inches. In the concluding of this blog (part three) we will be travelling to the Twilight Zone! With thanks to Robin Heath for permission to use his material. Would you like to come and meet Robin and hear him speak in person? 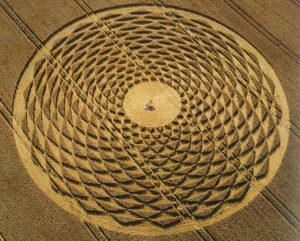 Robin will once again be speaking at our annual conference The Summer Crop Circle Lectures – August 3rd, 4th & 5th 2018. Click here for more details and to book. John Martineau’s beautiful drawings can be found in ‘A Little Book of Coincidence’ by John Martineau, Wooden Books 2001. Crooked Soley by John Michell & Allan Brown, Roundhill Press 2005. ISBN-13: 978-0954985509 Now sadly out of print, but occasionally secondhand copies can be found on the internet. I was looking at some of your blog posts on this website and I believe this web site is real instructive! Teaching in Korea, students lack the hangups of the West. We freely and openly discuss crop circles, alien intelligence, earth consciousness, the universal mind. Presently we’re reading Lisa See’s “Peony In Love”, which admirably illustrates the way to properly take care of our ancestors and the loving spirits in the old classical Chinese way. Very good!